Stay organized and save space with this handy steel metal mesh telephone stand for your home or office desk. This sleek and tilted design allows you to easily make calls while offering additional storage space underneath for your most important office items. The side compartment is the perfect place to store sticky notes for easy access to write down information and phone call details. SPACE SAVER - Telephone stand raises phone off desktop to make space for address book, memo, note pads, and other desk accessories. 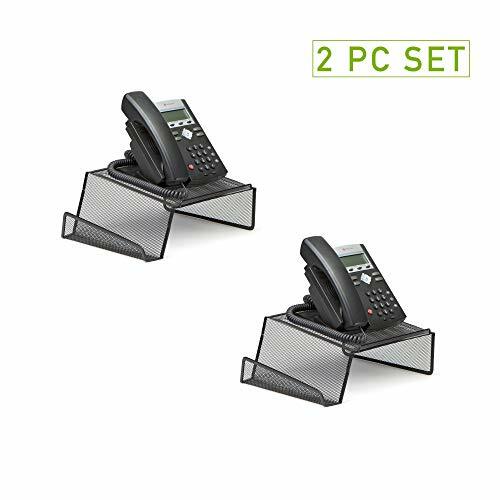 2-PACK - Comes with 2 phone stands; use one for your home and one for your office. LIGHT WEIGHT - No assembly required, easy to carry, and durable for all types of phones.